What a journey; I never thought, in my wildest dreams, that a year ago when I started writing this blog that it would still be going from strength to strength today. It all began as a way of staying in touch with friends; showing a few photos and telling them about our life in France and now I can still remember how nervous I was when I hit the ‘publish’ button for the very first time, my finger hovering over the keyboard; did I dare do it? Then, within a couple of months, I had one or two complete strangers following along, for I realised I had never made the blog private! I also just never imagined it would go SO public either! Yet here we are, one year later with 63 blog posts, thousands of photos and over one hundred thousand views (I still am in shock over that number) down the line and I’m loving it! So many of you have become virtual friends; I look forward to your comments and I so enjoy chatting with you. I love sharing our life here in France, the antics of Bentley, Evie, and the chickens. The ducks are quite another story, but I’ll share that one with you in the New Year. So now it’s time for me to say a huge THANK YOU to everyone around the globe; thank you for taking the time to read my posts, and thank you for taking the time to comment, like and share our experiences and stories. This blog is far more about you and my family than me. I have the easy part, I just write the stories and take some photos, but you all listen, and my darling children have got so used to me stopping and taking photos, one after another. When we go somewhere, anywhere, they used to ask WHY; now they just assume “this is for the blog!”. Of course Roddy also takes photos with me, and he listens to my ideas, so it’s really a family affair for without them, and you, there would be no blog! But I have enjoyed every second of this. It has been far more time consuming than I ever imagined, but I have, as a result, a far greater appreciation of everything around us; there is so much I want to share and thanks to you all I have an audience to share it with. Thank you also to many other bloggers. When I started this, I had no idea how blogging really worked. I read blogs, I followed blogs, but I had never ventured into writing my own. I asked advice from several people and I was quite overwhelmed by how friendly people were; everyone was willing to help, point me in the right direction and teach me things I certainly did not know. I still have much to learn, but I’m getting there and I always welcome your ideas. Anyway, to say ‘thank you’ I would like to give away, not one, but TWO original pieces of art. These are original pastels by my late mother-in-law, Margot Rampton. She studied at The Slade School of Fine Art in London and exhibited in London, Paris and Provence. Later in life she settled in the Channel Islands where she held many local exhibitions and supported many local charities. Very rarely does her work come up for sale nowadays, but occasionally it does and an original is sold from £300 ($450) upwards. Many local Channel Island shops sell limited edition prints for £25 to £50. But my giveaways are NOT limited editions – they are ORIGINAL signed and dated pieces of art. 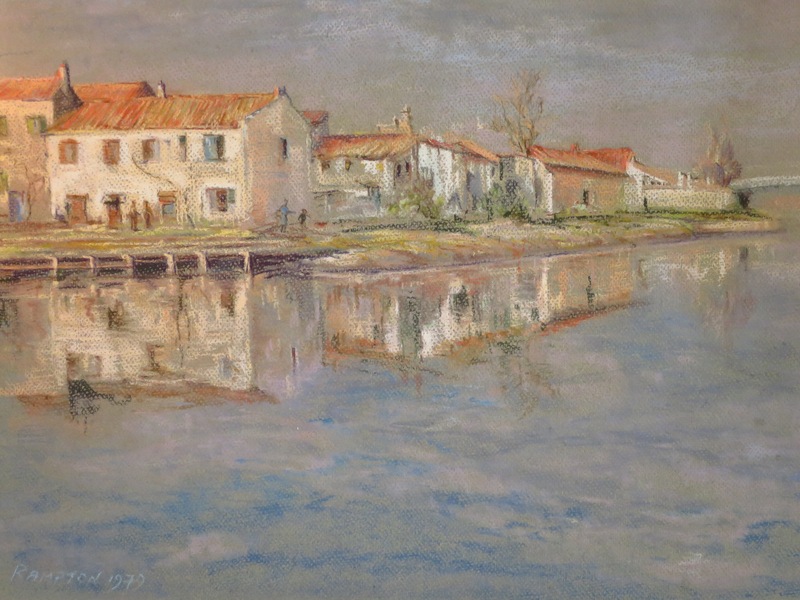 She lived for many years in Provence, she adored France and spent a lot of time in the Charente Maritime. The two pieces are from her portfolio of French scenes, many of which hang on our walls, one measures 22″ x 16″ (56cms x 41cms) and the other 17.5″ x 14″ (45cms x 36cms). All you have to do to win one here on the blog is (1) subscribe and follow (if you do not already), and (2) leave a comment telling me that you’re either already following, or you are a new follower. If you would like more chances to enter then you can invite a friend to follow; if they subscribe and leave a comment telling me they have done so and also telling me who invited them, then you will get a second entry and they will also get an entry themselves of course…..I hope this is fairly simple. You can also enter on Facebook and Instagram and I have details on both of my pages, so hop on over there and enter again if you want to and double, treble or quadruple your chances! You have until next Wednesday morning, the 2nd December to enter. We will then do this the old fashioned way and the children and I will write down everyone’s name (for in France there is no school on Wednesday afternoons), we will put those names in a hat and draw out two lucky winners and I will announce the winners later in the day, a week from today, so I can get these wrapped and mailed out to the two winners to arrive in plenty of time before Christmas. They are a thank you present, a Holiday present, or a Christmas present from me to you and it’s open to absolutely everyone, everywhere. Hi Elaine, thank you, I shall certainly make sure your name is written down and in the hat! I live in Alsace and love reading your descriptions of life “on the other side”, and in France in general. Sorry, don’t know if my previous comment posted…So I’m enjoying your blog from Alsace — that way I learn about a region I haven’t visited yet. I have been subscribed for quite a while now and love “traveling” with you. Your mother’s paintings are lovely and I could not venture to choose which I prefer. Please have a wonderful Thanksgiving, even though it is not celebrated in France. Maybe start a new holiday there as France could use something special right now. My best regards to you and your family as the holiday season begins. Hi Holly, I think the Thanksgiving holiday is actually a lovely idea, our daughter is cooking for all her friends at University in the UK today, even though she too is British, but she has friends there who are American and so they are all joining in together! Hi Molly, I would love to see one of her paintings in California, I shall be sure to make sure you name is in the hat! Wonderful pictures – and thank you for all your work too. It’s been great fun reading about your adventures. I have to ask, when is the book coming out ???? Hi Simon, maybe there will be a book one day, I’m actually tossing some ideas around in my head, so who knows!!! I have really enjoyed your well-written and interesting blog since its very first post. Great to see a different part of France highlighted and always something new to learn. Go girl! The paintings are very pretty and a beautifully original giveaway too. Creativity on all fronts. Lovely. I so enjoy following your blog! Was in Paris for a short time this year and can’t wait to return! What beautiful paintings…would look amazing on my wall. Prayers for peace this Thanksgiving from Plymouth Mass! I always did like Margots paintings. I hope they go to someone who deserves it. Happy Christmas and keep up the writing. These paintings are beautiul and anyone would be proud to have them in their home. I so very much enjoy your stories particularly about your family. Your blog is myy favorite. Greetings this Thanksgiving Day! I have been loyally following each and every post for several months, and although I’ve only visited Paris twice (2012 and 2014), I love to read about life in the French countryside. Have added my name to your subscription list. Would be delighted to win either of the paintings. Your late mother-in-law was a wonderful artist. My living room is currently getting a makeover, so a French painting would add an outstanding new focal point. All my best for the holiday season! These are lovely! I’ve been a follower for a while now. I have beem following your blog for over a year. In addition to reading it, after posting a comment you often respond. It is wonderful to k own that you take the time to read our thoughts. Religiously follow your blog, it is my secret treat on a Thursday afternoon at work. We holidayed for a number of years not far from you down at Les Mathes so I particularly liked your blog on Mornac-sur-Seudre and it was even more special that I knew exactly which shop Roddy was talking about with the shrunken heads etc. Keep up the good work, it really does make a difference to the rest of us. You really are a star, making such an effort to reply to all the comments!! I love reading your blog and following your little day trips, like the one to the island nearby after your daughter had her tennis lesson earlier that day……..and , of course, your dogs & other critters. I just found out that I might have a half sister in France, long story during WW2, so now I have an even stronger attachment to France. I will need to make a few trips to research this news. Your lovely blog really feeds my desire to go to France! Thank you for bring a bit of France to me every week! Thank-you so much Susan for all your wonderful posts & photos. Also, Roddy (how is his foot now?) and your childrens’ input. As others have said, it’s lovely to hear about another part of our beloved France. The paintings look wonderful so either would be much appreciated. Félicitations & bonne chance pour le futur. We are in beautiful Brittany in the Côtes d’Armor near Etables-sur-Mer. Hi Petrina, Sorry, I remember now I have asked you before! I love the northern Brittany coast line, spent many happy holidays there. I love your blog and follow it from this summer. I live a little way up north along the coast of The Netherlands in a small town:like you i love the see, the dunes and a relaxed life. I love your writing and how it makes me feel as though I am right there along with your family having adventures so different than my urban life. You’ve made me want to visit that part of France some day soon. Hi Bonnie, Thank you and I really do hope you do get to South West France at some stage, it is such a beautiful area. I will most certainly make sure you name is in the hat and good luck! I believe I must have been one of your first “followers” but didn’t realize it as I had no idea, until this blog, that you had just started “blogging” a year ago. You are certainly NO novice and I find you blogs so interesting. I can’t wait to get back to your lovely country as it has been too many years. You are fortunate to have had such a talented mother-in-law. Her paintings are exquisite and so remind me of the lovely villages and seascapes we enjoyed. Thank you and I continue to pray for Paris and your fellow countrymen/women! Blessings to you and your family! These paintings are toooooooooooooo GORGEOUS! How incredibly generous of you to offer these. SO, so special. What a wonderful offer. I have enjoyed your blog for several months. Your articles and pictures are always interesting. Thank you for sharing your life with us. Thank you for offering such lovely, personal, gifts. And for this blog, of which I am now a subscriber. I have you on my Feedly App and love seeing your stories. Congratulations on a very good blog. Happy Thanksgiving to you and your entire family and may the holidays be filled with good health, laughter and lotsa love! I have been following your blog since returning from a trip to France in September 2014. I would be thrilled to hang one of those lovely paintings in my home. Happy holidays! I’m not sure who gets more enjoyment from your blogs, the writer or the readers! It certainly has been satisfying to read along with your adventures and the change of seasons. It definitely helps in not missing you and the family quite as much, since I can see what you’ve been up to. The location of the paintings is perfect where you photographed them, and I think they should stay there! I look forward to each of your posts (I am an enthusiastic subscriber). My family has rented a house in Provence next summer and look forward to experiencing French life first -hand. Thank you for sharing with so many of us. Hi Kelly, thank you. How exciting that you are coming to France next summer. Provence is extremely beautiful, you will not be disappointed and I hope you have a fantastic holiday, try and get away from the tourist traps and mix with the locals! The paintings are lovely. Either one would be a treasure. We have been to France man y times and are looking forward to visiting again soon. Really enjoy your blog describing your French life. Hi Susan, thank you and I am so glad you are visiting France again soon, which part are you heading to? I love reading your blog, it gives me a better insight into how you live. Love those paintings. Hi Penny, thank you, our life is chaotic but fun! Congratulations on your blog. I started mine sometime ago and have friends from all over the world,some of which I have been lucky enough to meet. Love the paintings, and yes I do follow you though I am lazy about commenting! Sorry. Diane. What a beautiful prize. I love your blog. It always makes me happy to read it, and your photographs are lovely. They give such a wonderful insighf into your life, and one can imagine being right there with you. I am definately thankful for the joy you bring to your readers around the world. Thankyou so much for your blog. I look forward with eager anticipation for the treat of reading it when it appears in my inbox. And what a generous giveaway! Your photos are beautifully framed. Your exceptional writing makes me feel I am right alongside you. Susan, New to your blog, but have talked to you on Facebook😉 How generous of you to share your mother-in-law’s work. I am an art lover & would love a chance to win. Hi, I am relatively new to your blog. I love all the pictures and stories you share! One of your mother-in-law’s paintings would have a happy place in my home! Hi Amanda, thanks for your comments and I am so glad you are following along. I have visited Queensland more than once and love it, so it may be lovely here but it is also lovely where you are! Have a great hot summer weekend, whilst we are chilly and wet!!! I am so glad you decided to blog because I have enjoyed every one. I have never been to France so this blog has been a treat to me. 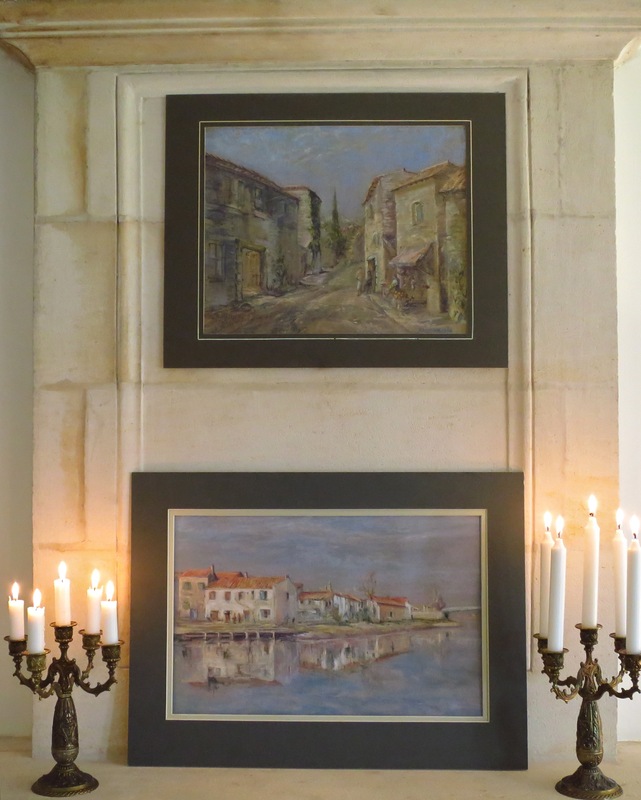 I love French decor….and the French paintings. Thanks again for your blog! What beautiful pantings! Am a new follower! Keep doing what you’re doing…very inspiring! Happy Thanksgiving! Love reading your blog & learning so much about France. It has been years since I visited your beautiful country. Love reading your blog & learning so much about your life in France. It has been years since I visited your beautiful country. The paintings are treasures & would love to win one! Your blog is great! I love to see it in my inbox. How very generous of you to offer the paintings. I love France, so reading your blog has kept me feeling in touch with that beautiful country. Thank you for writing such interesting pieces about your life there. Well..your blog is the first one that I every commented on. As I type I am in your former area of France….the sunny South. Congratulations on a very special blog. Love both of these paintings and would be more than happy to display either in my home!! Love this blog – I have been following for a while now and really appreciate the time and effort it takes to post on a regular basis with such a busy lifestyle. Keep up the great work!!! I am a new follower! The paintings are beautiful!! I follow My French Country Home on Facebook and they posted about your blog and giveaway. My apologies if this is a duplicate comment. I am a new follower and saw a post on FB from My French Country home which I follow sharing your blog and this giveaway. The paintings are beautiful and I look forward to following your posts. So excited to learn of your blog. I am a new subscriber (as of today) and look forward to getting to know you! Thank you for the opportunity to win one of these beautiful works of art! Beautiful blog, photos, and paintings. I’m a US follower and enjoy all you do! I love reading your blog and looking at your pictures. Visiting France is on my bucket list and until I’m able to make that dream happen, your blog and pics make me feel like I’m there. Hi, Susan. I am a Francophile, and I swear I lived in France in a previous life. I am slowing in the process of decorating my home in a French Cottage style. I am also an artist, although I have yet to try pastels. We also collect fine art when we are financially able to do so. Both of the paintings are exquisite, but I am particularly drawn to the second one. 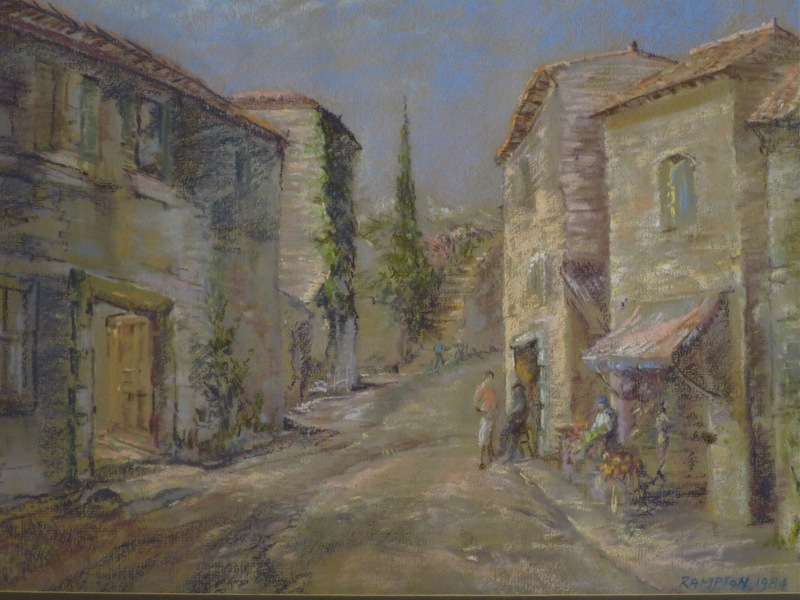 My husband and I spent a week in Mougins, and that painting reminds me of that village. Congratulations on your blog, and I am so glad I found you! I love reading your blog and looking at your pictures. Visiting France is on my bucket list. Until I can make that dream happen your blog and pics make me feel like I’m there. I am a new follower and delighted to be added to follow your blog:) Oh, the paintings…lovely! I enjoy your blog so much and love the your beautiful photographs! I would be honored to win one of your mother-in-law’s fabulous paintings and treasure it!! Please enter my name for the drawing. Thank you so much. Hi, I am a new subscriber and a lover of all things French! Love the paintings which would find a lovely spot In my home. Wow! How did I not know about your blog?! I am a new follower thanks to Sharon at “My French Country Home”! I have now subscribed to your blog via e-mail and Facebook and look forward to reading your past posts. The paintings that your late Mother-in-Law painted are absolutely fantastic; what a wonderful talent she possessed! Thank you for the opportunity to win and I am now so honored to be a subscriber and fan of your blog! Visiting France has long been a dream of mine and I do hope one day to finally have the good fortune to seeing your beautiful country! Hello! New follower here! Being of French descent, I adore anything Francophile! I have been to Paris twice and to Provence a couple of years ago – loved it and hope to go again. Absolutely love these paintings, but especially love the one with orange roofs – so reminiscent of my travels there. How fortunate you are to live where you do and to have this wonderful artistic legacy! Ok, let’s try this again 🙂 I think my first post is floating in cyberspace! Being of French descent I adore everything Francophile (née LeToile). I have been to Paris twice and to Provence a couple of years ago – hope to go again soon! I love both of these paintings! So reminiscent of my time there, but have to confess I especially love the one with the reflections in the water :-). How fortunate you are to live where you do, and to have this artistic legacy! Thank you for sharing with us. I have been following your beautiful words and pictures and look forward to see what else you have for us. It would be wonderful to have a beautiful piece of art of your mother’s here in my home in SUMMERLIN, LAS VEGAS, NEVADA. Please continue your blog and thank you for allowing us to spend time with you. I’m a new subscriber, the pictures are absolutely lovely. Lovely paintings. I’ve just added myself to your email listings and followed for FB. Hi Lisa, great to have you following along and welcome to he blog. Several of my ancestors were excellent artists too but I have to admit the gene has totally bypassed me!!! Beautiful ! I have enjoyed your blog and hope you continue for a long time. Dear Susan, I have been reading your charming blog for quite aahike and just now, finally signed up to get it in my email. What an honor it would be to actually own one of these exquisite original pastels by your late mother-in-law, Margot Rampton !! I have dreamed of going to France all my life. In the meanwhile, our home decor has been inspired by the elegant French aesthetic and I travel to France vicariously through the pictures and stories that you tell. Thank you for your kind generosity. I’ve followed you on Facebook for quite some time with great enjoyment and have just become a subscriber. I’ve recently moved to a new home in Florida and either one of these paintings would look beautiful in my library. I’ve been following your blog for quite awhile, and enjoying so much your stories about your ideal life in my favorite part of France. I also enjoyed your “scary” story for Halloween. Happy Holidays to you and your family! Hi Judy, thank you and am so glad you enjoy following. The Halloween story was something a little different but great fun to write! I will be continuing with the same family at Christmas! Thank you for sharing so much with us. Hi Carolyn, thank you and great that you are now following the blog. I don’t know exactly where the paintings are. The first one I am quite sure is Provence, the second I believe may well be here in the Charente maritime, one of our Atlantic Islands , the Île de Ré the Île d’Oléron perhaps. Just discovered your blog and enjoying it so much! The pictures are both fabulous. I live in Louisiana where our culture is very close to the French and I have visited lovely Provence a few years ago. I was sad when I had to leave but have some great memories. What an awesome gift this would be!!! I read your blog often and am signing up to follow right now. I have admired your work for a while now and love reading about your French adventures. I’ve only been lucky enough to visit France once…..only wetting my appetite to go back for more. The paintings are so gorgeous! The paintings are lovely. I would be honored to hang either in my home. My day is brighter each time your blog appears in my in box. I have been a Francophile for years and am looking forward to taking my grandson and granddaughter to France in May. Hello from Texas! What a treat to find your blog! I’m looking forward to reading some of your past entries. These paintings are beautiful. What a treat to be able to own one of them! I’m off to begin reading!! I absolutely love your blog! Your stories are like tiny chapters in a wonderful ongoing novel. I have always dreamed of visiting the French countryside, and I can through your stories! We have had a peaceful Thanksgiving here in South Carolina. So much to be thankful for. I am a follower…I am enchanted with all of the info and photos, both. It is a wonderful way to garner knowledge and also, to help plan for my trip to France! Hi Lee, thank you and glad you are gathering information for your trip to France. It is a beautiful country to visit, so many different places, try and get away from the tourist areas and off the beaten track a little. I follow you and my mom does as well. She told me about your blog and beautiful pictures. She absolutely loves reading all of your posts! I would love to win a painting for my mom! Like many before me wrote, it is wonderful to follow you through stories and photos of the French countryside. And, I must say, how nice it would be to win one of the original paintings done by your mother-in-law! I would be honoured to hang it on one of my walls. I’m a subscriber and a fan. The paintings are just lovely and is old be honored to win! Hello! I have just come across your blog today and I look forward to delving into past stories. My own family has been back in Australia now for a couple of years after a 3 1/2 year adventure near Annecy in the French Alps. I am sure that as I read I will be constantly nodding and smiling at similarly shared adventures. My own children at the time of arrival were 6, 9 and 12. Yes, a tricky age on one hand, but a perfect age on another. Very happy to share our experiences – or feel free to look me up at butyouareinfrancemadame.blogspot.com. Hi Catherine, I shall be sitting down and reading and no doubt emailing you! Sounds as if we have much in common. Ours were 8,9 12, 14 and 18 when we returned to France after four years away. The older ones spoke French the two youngest, scarcely a word. As you say in some way the age is difficult, in someways it was easy, they have literally loved every day here and I have never seen them so happy, so something is working!!! Thank-you for getting back to me. I’d love to chat more with you about your four years away before moving back to France. Motivations, reasons for leaving and then coming back etc. We returned to Australia at the time that my oldest daughter was in her last two years of school. Have I ever really re-settled? Probably not. In the words of a friend, who tried hard to console me before leaving France, “now, you will have two places to call home”. And. yes, this is true, but the pull to return to France is still very strong…so, I am curious to hear more of your story (perhaps it is in the blog?) as I am sure there will be resonance from my end. I found you today via My French Country Home. I am so excited and looking forward to reading your adventures. It has always been a dream of mine to visit. It is now also my daughters! So I am giving her a vintage leather suitcase for Christmas, for her to collect her books and treasures about France and our place to stash our vacation money! I am also furnishing my home with a French influence. I would certainly be honored if I were to be the recipient of one of the beautiful paintings. Thank you for the opportunity. I will be sharing your blog with my daughter! Hello, I a a new follower and I find your blog very interesting and well made. The paintings are beautiful. I’m new to your blog. Discover it through Facebook. I found your blog today and look forward to following you. The paintings, and your blog photos, are indeed beautiful. I am an artist these days (yay) and love all things French, so your writing and images brings me much happiness to vicariously enjoy your wonderful adventure in life and living. The paintings are both lovely. Thank you for sharing your life in France with us and allowing us to vicariously live our dream. I,and I’m sure I am not alone, am very jealous. What a lovely giveaway to offer your readers! They are both beautiful pieces of art that anyone would probably love to add to their decor. I’m writing from the Midwest in the United States. I found your lovely blog by way of My French Country Home. I would like to enter the contest to win either one of the stunningly beautiful paintings…although I must admit, the village scene makes my heart pitter patter faster. Your mother-in-law was a wonderful artist and you are a wonderful blogger. Thank you for your generous spirit. I noticed your blog via your comment on Sharon Santoni’s, and I am so glad to have found you! I look forward to reading more. Thank you for the generous giveaway. This is my absolute favorite type of art! I noticed your comment on Sharon Santoni’s blog and am so happy to have found your blog! I look forward to reading more. Thank you for the generous giveaway; this is my absolute favorite style of artwork! I have just found your lovely blog and subscribed. It would be great to win one of your very talented mother in laws pastels…. The last time I won something like this I was five and I won a yo yo…more years ago than I care to recall ( A hard days night by the Beatles was the new number one!!) I look forward to reading more of your adventures. This blog is such a new found joy for me. Thank you for sharing peeks into your french living of life. How lucky you are to have a collection of your mother-in-law’s beautiful paintings….she was a very talented lady! Both of the art pieces are lovely and I would be privileged to have either one hanging in my home. Living in Canada, we do not get to enjoy these types of scenes unless we travel. I really enjoy reading your blog for the content as well as your writing style that includes us all in many of your family adventures. Your photographs share the beauty of a far away country that I truly hope to visit one day! Hi Cher, thank you so much and I would love to see a painting go to Canada, I have many distant relations in British Columbia, your name will be in the hat tomorrow and good luck! I really do hope you get to visit France one day, it is a beautiful country with so many different places to see. I am new to your blog,and it is a wonderful trip to France. My home in Southern California is very French and one of the paintings would look spectacular and would be greatly enjoyed. I am a new “official” follower but I have read your blog before and find it charming. The paintings are beautiful and whoever wins will be very lucky. As the rabbit in Alice in Wonderland says: “I’m late. I’m late for a very important date!” Never mind. I’m new here and discovered your lovely blog. Your Mother-in-law’s art work is simply gorgeous. I know they will be loved in a new home. Many years ago (1969) my parents treated us with a trip to Europe and France was very, very special for me. I cannot wait to catch up reading your blog! Hi again Susan, would be most interested in continuing to chat about your family making the decision to return to France after some time away. As I mentioned in my last comment, the return to Australia was difficult for my family and, although many would consider us lucky to have been able to live in our adopted country( as do we) it has left us open to not fully investing in the here and now. I”m not sure whether you found my blog Butyouareinfrancemadame – Hope that you enjoyed a browse if you did. Look forward to hearing back from you.